Notation marks and explains, it communicates and documents, it prescribes and produces. Within such notational possibilities signs are able to formalise, to solidify but also to expand practice. And while the ritual of performance practices in Classical Music might be seen as highly regulated, in which the performer is often posited as a self-effacing, faithful servant to the notated work, there exist certain practices, including free music improvisation, that not only question notation (and much more!) but that revel in the absence of notational signs. 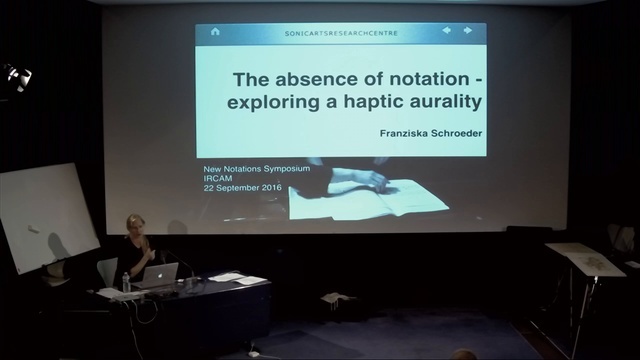 Taking as a starting point Jean-Louis Schefer’s idea of a ʻpractice of notationʼ (1995), I want to think of notation as a colouring of signs, rather than an execution of signs, but going further, I will examine the absence of notation in some improvisational practices and argue that an absence of notational concepts allows performers the creative space for turning inward and for straining towards self (Nancy, 2002). This turning inward becomes a highly intimate, tactile or haptic listening space (examined as haptic aurality in Schroeder, 2009) that not only involves constructing and consolidating the self, urging the performer to be in a constant state of being on the ‘lookout for a relation to self’, it also allows the performer in rejoicing in her body, in noticing her presence and in being self preoccupied in a very tangible relation with her tools. Since I understand free improvisational practices as creative and social exchanges between musicians anchored in high levels of trust, I want to consider music practices that question or ignore notational signs as practices that allow for a deeper reverence for musical, cultural and social engagements with others. With the introduction of computer models into free improvisation practices (the use of Probabilistic Graphical Models, such as Bayesian and Markov networks, as explored in Kalonaris in 2016), we see a return to a desire for notational instructions. Such turn towards imposing notational frameworks counters the socio-political spirit of some of the original ideas of what is meant to be ‘free’, while it shifts the musician’s focus towards the visual sign. Where this move towards a more regulated notational framework will lead free improvisers is yet to be seen - it is certainly a journey that some musicians take reluctantly, always in the hope that the notational signs will further expand, rather than solidify, their practice.